We have linked with a carefully chosen selection of suppliers who offer child-related products. These include school equipment suppliers and online retailers of educational toys and games. We also have some great recommendations for family-friendly food delivery services. Scooterearz are clever hand mitts for children's scooters. During the winter the children still want to ride their scooters when we go out for walks but they do find that wearing gloves just doesn't give them the same grip as they would have without them, but when they take their gloves off they complain that their hands are too cold! 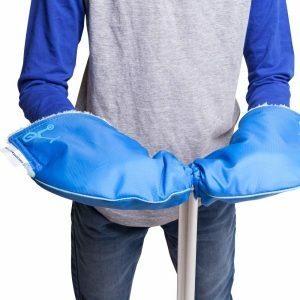 Scooterearz will fit almost any scooter; they are easily pulled over each handlebar and held in place with elastic ends, at the other end the mitts are open with velcro fastenings which allow your child to quickly slide their hands in and out of the mitt. They keep hands warm with their furry lining as well as being wind and waterproof. 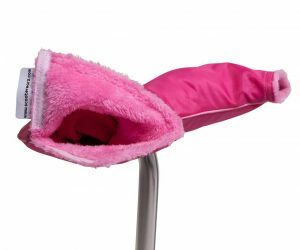 We have been using these on the cold days and it certainly makes getting out of the door quicker as there is no hunting around for gloves and the children are much happier being able to grip the handlebars properly. Scooterearz Hand Mitts come in a range of colours and designs which you can find on their website. 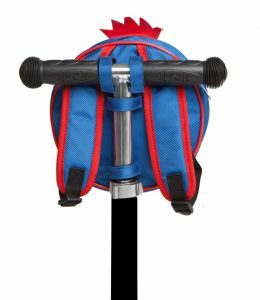 To compliment the Scooterearz Hand Mitts we have been using scooter Bagz which also come in a range of designs. 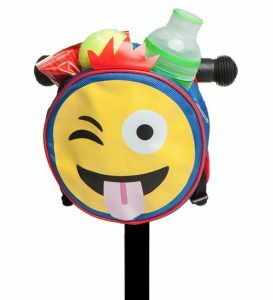 They attach to your child's scooter with velcro and are perfect for carrying drinks, snacks or pocket money around in, I love these as it means that I don't have to carry all their stuff! The zip opening is on top of the bag so the contents can be accessed quickly and the velcro fastenings make them really simple to put on and remove from the scooter; they are waterproof and wipe-clean as well as having backpack style straps on the back so they can be used when they are not attached to a scooter. Bagz can be found here from Scooterearz website. 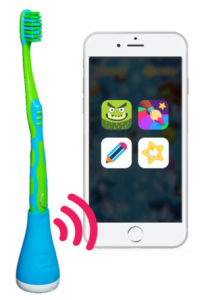 Playbrush is a clever attachment for manual toothbrushes which connects via Bluetooth to a tablet or smartphone and not only motivates children to brush their teeth by making it fun and interactive, but the games will also help them make sure that they are brushing properly. We received a Playbrush Smart to review and in the box you get: 1 x Playbrush Smart, 1 x manual toothbrush, 1 x charging cable, 1 x smartphone holder and some instructions. Charge the Playbrush Smart (this is the part that attaches to the bottom of your toothbrush) and then slot your manual toothbrush in to the top of it, or you can use the toothbrush that comes in the pack. Download the Playbrush app (free to download) for your child and then connect your tablet or smartphone to the Playbrush via Bluetooth, once it is connected it will flash green. The Playbrush will go in to sleep mode if not touched for 1 minute but it can be woken up by touching it. Once you are connected you can choose a game to play while you are brushing, each game needs to be downloaded the first time you play them but this just takes a few seconds. The smartphone holder is a plastic pocket with suckers that sticks to tiles or glass which your phone or tablet sits in to keep it safe and dry! 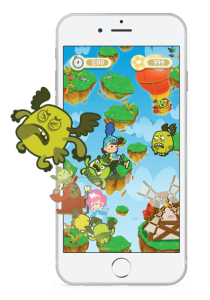 The games are fun with lots of sound effects and encouragement and your child definitely won't realise how long they are spending brushing their teeth, my mini reviewer is a big fan of the Utoothia game where he has to fend off the baddies! The Playbrush Smart attachment is light so it doesn't feel too heavy for younger ones to hold and the app is easy to use and navigate if you are letting your child choose the game themselves. The app has a handy brushing coach which gives your child instructions on how to brush the whole of their mouth correctly as well as games for ages 3+ and games for ages 6+, there are more available but this requires a monthly subscription of £2.08, however, you can earn points for regular brushing that can be converted in to cash which effectively pays for the subscription. 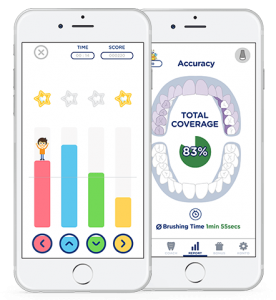 The Playbrush Smart subscription can also give parents data which measures the position of the toothbrush, duration and regularity of brushing and you can see the stats on the app to find out how well your child is doing and give help if needed. The Playbrush has really helped my mini reviewer to be more enthusiastic about doing his teeth, I don't have to remind him anymore which makes this a great product for children who aren't that keen on brushing their teeth or those who aren't quite thorough enough. 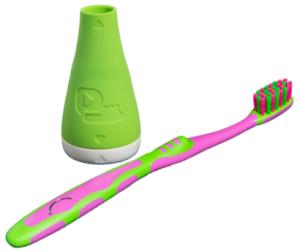 The Playbrush Smart comes in 4 different colours and is currently £24.99, the Playbrush is also available as a fully integrated electric toothbrush for £29.99- find both on the Playbrush website. I love the concept of OKIDO magazine, and the fact it is intended for children as young as three - the suggested age range is 3 to 7. It's relatively easy to find high-quality science resources for KS and KS2 children but OKIDO is brilliant because it taps into the natural curiosity of younger children, as well as continuing to extend that curiosity as they get older. We were sent two magazines to review. The first, issue 65, is all about coding and includes stories, experiments, games, doodles, a recipe and a poem; there's even a secret code machine. The mix of activities works well and really help children to grasp this complex but essential subject. Our second issue, 66, is Heart and Blood and the special activity in this is making a body puppet. Visually, the magazines are attractive and engaging, with plenty of bright pictures, helpful diagrams, good use of fonts and clear directions with a purpose to every activity. 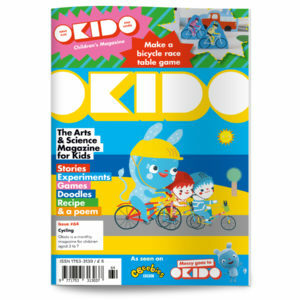 Cycling, dinosaurs, colours, music, transport and ice - just a few of the many subjects covered in the magazine (back numbers can be bought from the OKIDO website). The focus on just one concept is perfect for young children and works far better for them than jumping around from one subject to another. The range of articles and activities is so wide-ranging that there is plenty to engage children's attention and give them a really good grounding in the topic - and to make it interesting for them so they are keen to learn more. OKIDO’s philosophy is a simple one: every child is a creative scientist; the OKIDO world immerses young children in a spectrum of playful activities and media, all intelligently designed by science and education experts. There is plenty to enjoy on their website, which extends on the activities available through the magazines. Messy goes to OKIDO is a popular CBeebies programme in which Messy, a monster, explores science questions that children ask about the world around them.At the heart of it all lies STEAM learning (that’s science, technology, engineering, the arts and mathematics). Everything in the OKIDO world is designed by science and education experts to encourage collaboration, curiosity, exploration, discovery, creativity and critical thinking. This is so apparent both through the magazines and on the website; its founders, scientist Dr Sophie Dauvois (PhD BSc PG Dip.) and artist Rachel Ortas, are still every bit as passionate about engaging young kids in the scientific world around them using play, art and fun. This passion really does shine through and children respond really well to the enthusiasm and to the wide-ranging activities. OKIDO is available with a range of subscription options: from £30.00 every 6 months. £30.00 every 6 months.Each issue is 48 pages jam-packed with stories, regular characters, doodles, poems, games, experiments, a pull-out centrefold activity and a recipe that the family can make together – keeping children engaged for hours with things they can do on their own as well as with a grown up. I love the concept of something children can look forward to on a regular basis; it really generates enthusiasm. It's a perfect gift that children will enjoy year-round, long after many are consigned to the back of the cupboard. Highly recommended. These over-ear headphones have a maximum volume of 85db which makes them safe listening for little ears; they have a cable length of 1.2 metres and a 3.5mm jack plug. The headphones are customisable and come with 6 sets of cards and 3 colouring pencils. 2 sets of the cards have ready-made designs on them and 2 sets have outlines drawn on them which you can colour in, the last 2 sets are completely blank for you to design and colour in yourself. The cards slot neatly in to the ear cups and are easily changed. The ear cups are well padded, very comfortable and the headband is adjustable so they fit perfectly; they are suitable for age 3+ and they still fit our mini reviewer (7) with plenty of room left for growth. Being able to customise the headphones is a great feature and the cards simply slot in and out of the ear cups so you can change them as often as you like. You could easily make some more cards if you wanted to change your designs by using one as a template and cutting more out of new card. 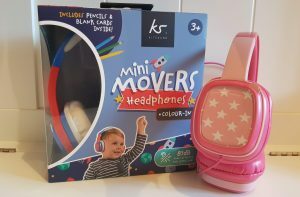 The Mini Moovers Headphones retail at £15.00 and they are currently available in pink and blue. Many of us will be familiar with using lemongrass in cooking but did you know it makes a delicious tea as well? Lemongrass tea may be a relatively unknown drink in the UK, but it has a long history of use in parts of Asia, where it is not only drunk for its great taste, but also to aid relaxation... something we can all do with at times! Just the simple act of putting the kettle on and anticipating a relaxing sit-down is good, but with Natur Boutique’s Organic Lemon Grass Tea you can enjoy a relaxing drink that can help to relieve stress. We found the tea smelt good (unlike some herbal teas) with an appetising smell that filled the kitchen. Studies have shown lemongrass could help reduce anxiety, tension levels and is even capable of helping certain muscles relax. It's up to you to decide, but if you want a tasty hot drink, then this fits the bill with its subtle citrus flavours of lemongrass. It's available from Amazon.co.uk, health stores and www.naturboutique.co.uk for just £2.99 for a twenty tea bag box (November 2018). Muffins are popular at any time of day and increasingly so at breakfast time, so why not get the day off to a good start, perhaps for a weekend treat or part of brunch, with these delicious muffins? This is perfect to give you the energy to get through the day. With super-healthy ingredients including oats, flax, dates and carrots, this nutrient-dense snack tastes delicious and is so quick to make - only five minutes to mix and 20 to bake. You just need to add eggs, fat, water and honey or sugar to the dry ingredients. You are free to choose between type of fat and sweetener, so you can accommodate dietary needs - a useful feature. You can even add nuts for extra nutrition. For something that tastes so good, these do you good too - the fibre in oats, beta-glucan, has been shown to lower cholesterol. Consuming at least 3g of oat beta-glucan daily can significantly lower cholesterol levels. Also contains omega-3 loaded, heart-friendly flaxseed. The full ingredients are - Gluten-free Oats (26%), Gluten-free Plain Flour (Rice, Potato, Tapioca, Maize, Buckwheat), Dates, Dehydrated Carrots (14%), Flaxseed (9%), Raising Agent: Baking Powder, Cinnamon, Ginger. Quick and easy to make and really tasty. Do look at the whole Sweetpea Pantry range, which has grown a lot since our first reviews. This is Sweetpea Pantry's popular chia and flax pizza dough, which is full of wholemeal wheat flour, chia, flax and oregano, and makes two large crispy bases. One of our favourite family lunches is DIY pizza, and we give the children bowls of topping so they can create their own favourites. These tasty bases are easy to make and children thoroughly enjoy getting stuck in and mixing the dough by hand - as there's plenty here, we divided the dough into two so each child could make their own. You just need to add two tablespoons olive oil and some warm water. The hour proving time gives you the opportunity to get all those toppings together! Roll the dough out as thinly as possible for a really crispy base - delicious and healthy too. The ingredients are: strong wholemeal wheat flour, strong wheat flour, yeast, chia seeds, flaxseed, oregano and salt - no wonder this pizza base mix is so tasty, with all those super ingredients. The pizza dough is dairy-free, vegan and vegetarian, high fibre and no added sugar. Buy from The Sweetpea Pantry Shop; price November 2018 £2.75. "Sweetpea Pantry are passionate about delicious real ingredients, free-from choices and helping you feel amazing by providing nutritious and good-for-you Ready Mixes. Good food shouldn’t have to be hard to make, and it definitely should taste good. ​Our mixes are gluten-free and dairy-free, with no added sugar (so you can choose your sweetener of choice if required) and they are vegan friendly. Our all-natural ingredients are from ethical producers and most of them grown in the UK. We love to use flax, quinoa, chia, oats and other highly nutritious and super powered grains and flours. Use our mixes to make wholesome meals and snacks - they cover favourites like pancakes, pizza dough, flapjacks, brownies and carrot muffins - or try some fabulous variations using our mixes for energy bars, waffles, crackers and fruit crumble." 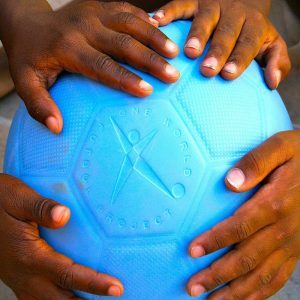 The One World Futbol project started in 2006 and was created for children living in harsh conditions where standard footballs didn't last long and the unpoppable futbol was developed. In 2010 the One World Futbol Project was launched with a mission to bring the transformative power of play to youth living in disadvantaged communities worldwide. In 2014 they celebrated the delivery of the 1 millionth ball and a year later the project was re-named The One World Play Project. The One World Futbol feels just like a standard football when kicked and the weight feels the same, although it does make a slightly different noise when kicked. You do not have to pump it up as the ball arrives inflated, but it is not actually 'inflated' which is why it is 'unpoppable' It has proven to be very durable and is great for using in all weathers outside, as well as indoors. We have been using this for a few weeks now and it shows no signs of wear (just a little dirt!). Standard footballs can last a long time if treated properly, but you can also kick a new football in to a hedge and it will have a hole in when you retrieve it; the One World Futbol has been kicked in to hedges several times over the past few weeks and has come out unscathed. These would made great training balls for both youth and adult football teams as their durability will save money in the long run. We have been very impressed with the performance of this ball and so far it has shown its strength when kicked around for hours by a group of 8 year olds! The One World Futbol is made from a cross-linked closed cell foam and comes in either green or blue, you can either buy a single ball, or in bulk (from their website) and they are available in size 4 and size 5. 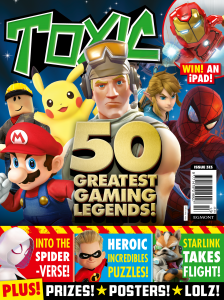 Toxic magazine is aimed at children of 7 and over and is full of all sorts of fun stuff like competitions, posters, facts, comics and movie reviews. 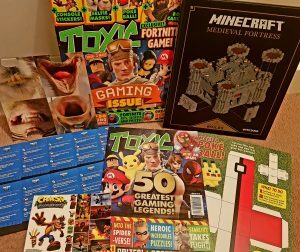 We were sent issue 313 (Gaming Special) to review which counts down the 50 Greatest Gaming Legends and comes with an official Minecraft Build book. Inside the magazine it's jam-packed with news and features from your favourite games, a Pokemon feature, Fortnite hints and tips, lots of competitions, puzzles, a Lego DC Super Villains poster and there are also two double page comic strips. The layout of the various features in the magazine make it look really appealing to children as it is incredibly bright and colourful and is sure to hold their attention. Toxic magazine is published by Egmont and is printed on good quality paper which makes a big difference to the vivid colours that bring your child's favourite characters to life. This issue also came with a set of console stickers, a set of selfie masks, make your own Poke Ball and some Fornite gaming cards. Towards the end of the magazine you get a sneak peek at what is included in the next issue, as well as the free gifts that are included. My mini reviewer is 7 and this was the first time he had read this magazine; he really enjoyed it and read it from cover to cover with enthusiasm and he is now reading his way through the Minecraft book that came with it. Although my mini reviewer loves reading, I think magazines are a really great way to get more reluctant readers interested in reading and books; once they realise that they can really enjoy what is written, and how much they can find out from it then it can really encourage them to start reading a wider variety of texts. Toxic magazine is £3.99 and is out every three weeks, which we think is brilliant as weekly or even fortnightly magazines can add up , especially for those with more than one child. Head over to the Egmont website to read more about it or over to the Toxic Magazine website to find your local stockist. With growing children that seem to want to eat more and more I find it really difficult to find snacks for them that are healthy. 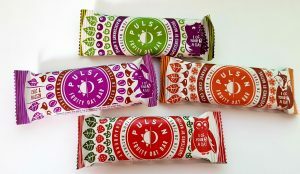 Pulsin Fruity Oat Bars are made with real fruit and 100% natural ingredients, they are made with gluten free UK oats, have no preservatives, no artificial flavours, have no refined sugars and count towards 1 of your 5 a day. We were sent four packs of bars to test out; Choc & Raisin, Blackcurrant & Apple, Orange Choc Chip and Strawberry. All four bars are under 100 calories and have 1/3 less sugar than the average kid's fruit snack. Each bar got a great reception from the children, their favourites were the Orange Choc Chip and Strawberry. Pulsin bars are perfect for taking out and about, lunchboxes and for snack at home and they retail at around £2.50 for a box of 5 which is just 50p a bar. You can find Pulsin bars in leading supermarkets and on the Pulsin website, where you can also see their full range of goods including adult snack bars and protein powders. 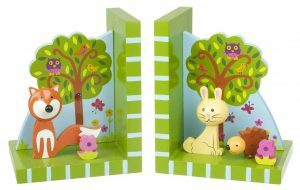 This lovely set of wooden bookends feature a hand painted fox, two flowers, a hedgehog and a rabbit (all 3D) sitting in front of a woodland scene. The base of the bookends have foam grips in each corner which help them to stop slipping on the bookshelf. They are made to a high quality and are very sturdy; non-toxic paints have been used to decorate them and each bookend measures 16cm x 9cm x 12cm. These would look lovely in any child's room and Becky & Lolo have a range of other Woodland themed toys to compliment them. The unisex design makes them the perfect gift and you can see the range here. This lovely little box of cards was developed by specialist clinical psychologist, Dr Karen Treisman, aimed at both professionals and parents, it contains 70 cards and an explanatory booklet which guides you through them. The cards use a range of techniques that can aid children (and adults) express themselves and their feelings by helping them to feel safe and create effective coping strategies for a variety of common issues such as stress, anxiety and emotional deregulation. It is suggested that you first familiarise yourself with the cards and select the most appropriate ones; they can be used in all sorts of ways from letting the child choose one themselves, integrating them in to games or using them as a teaching tool. The cards have a vast assortment of suggestions including breathing exercises, talking positively, imagination, colouring, yoga and playing with sensory items, to name just a few. The accompanying booklet is excellent, it clearly explains the uses and the different ways in which they can be used and interpreted. Some of the cards have a blue book icon on which indicates that you can refer back to the booklet where you will find ways of extending on the cards in the pack. 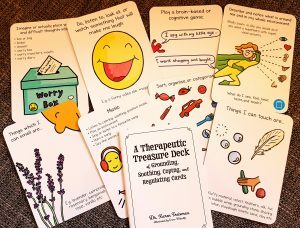 These are so much more than just cards for positive thinking and coping; they really help you to understand the theory and psychology behind them and they can be personalised to your child and situation. 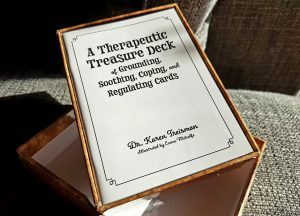 A Therapeutic Treasure Deck is aimed at using alongside children of 6+and retails for £22.99 (October 2018), you can find them here. 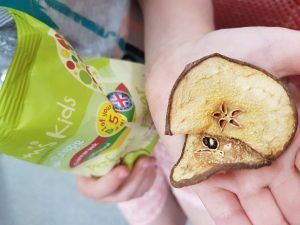 I was really looking forward to trying these out as an alternative to crisps, especially during the school holidays when it can be tricky to keep finding healthy snacks day in, day out for three hungry children! We were sent Nim's Fruit Crisps in 'Perfect Pear', 'Amazing Apple' and 'Cool Courgette' to try. Nim's Fruit Crisps are made by taking fresh fruit and vegetables, thinly slicing and then letting them air-dry. This process allows the product to stay crisp and crunchy, just like potato crisps! You can also see this when you take them out of the packet; they are very thin slices of apple, pear and courgette. There is nothing added to them, and nothing taken away so there is no salt, oil, preservatives, artificial flavours or any other nasties. 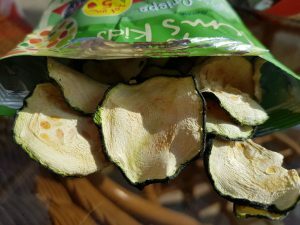 The crisps are light and the children enjoyed seeing the real fruit slices, we found that the courgette ones were crisper than the fruit ones and the flavours were a good balance, not too subtle, but not overwhelming either. These make a really good change from crisps for the children, it's good to know they are completely natural, full of vitamins and fibre and only 50 calories a bag. 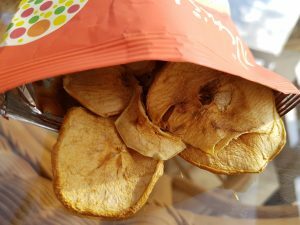 Nim's Fruit Crisps also say that because they use full fruits, the are able to operate a zero waste policy which is really good news. There is also an adult range to try which includes Pear, Apple, Beetroot & Parsnip and Pineapple flavours. 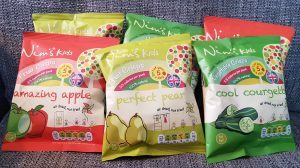 You can buy Nim's Fruit Crisps online from Ocado and you can view the range on the Nim's Fruits Crisps website. 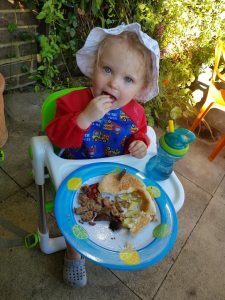 We have been reviewing the Apramo Flippa Dining Booster Seat this week which has made a big difference to our mealtimes! 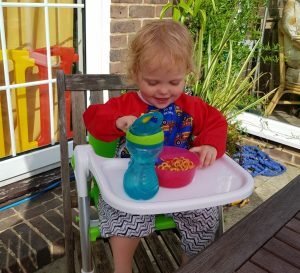 We have been eating outside a lot over the last couple of months while we are enjoying the sunshine but our outdoor chairs aren't really suitable for a toddler. The large chairs are not safe enough for her to sit on with the risk of falling off and our smaller chairs, which our slightly older children use, can be a bit wobbly if you fidget too much. The Apramo Flippa seat fits perfectly on to our outside chairs so we have been able to enjoy lots of al-fresco dining! The Flippa seat is designed to fit on almost all four legged chairs, so it easily attached to our dining chairs and outside chairs. It comes with an illustrated instruction booklet and the chair itself comes neatly folded. To use it you press the button on either side of the tray and then pull it out, place it on your chosen chair and use the straps to secure it to the chair; there is a strap to secure it underneath and one for the back along with a harness for your child. This clever chair has adjustable feet so you can make sure that it doesn't lean too far forward or too far back by unscrewing each foot so that it sits level. The tray is removable which makes putting your child in and taking them out much quicker as well as making it easier to clean, it can also be used without the tray which allows your child to sit up close to the table. The Flippa chair is simple to fold back up again for storage and transport and it has aluminium legs which make it both lightweight and strong. It is perfect for taking out and really useful if you are visiting friends or relatives who may not have a high chair. We will be taking it with us when we head off on holiday soon! 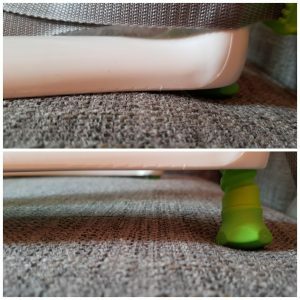 The Flippa Dining Booster Seat feels very stable when secured to a chair and the adjustable feet are a great feature, they are also rubber so this stops the chair from slipping. It is light and easy to clean and it will fit back in the original box for transporting it. The chair comes in a range of bright colours; pink, green, orange, blue, red and purple. The Flippa seat is suitable from around 6 months to 3 years old and currently retails for £44.99. Cooking with children is great fun and it helps them learn a range of key skills too - not least of which is learning about healthy eating. Sweetpea Pantry was founded by two busy mums who couldn't find any great tasting ready mixes on the shelves that added nutritional value. So they decided to ensure busy people had access to great tasting, easy options for snacks, treats and meals. Their Ready Mixes are not loaded with sugar (they never have sugar in the top three ingredients) but have plenty of fibre, nutrients, texture and flavour. The mixes come with all the dry ingredients ready blended, which is great when cooking with children as they often don't have the patience to ensure everything is thoroughly mixed. They have easy to follow instructions to make healthier versions of your favourite snacks and meals without all the mess, packets of ingredients and the drama! There are two ranges. The free-from range includes Grainy Brainy Pancake Mix with buckwheat and flax (gluten-free), Super Oat Flapjack Mix with quinoa and flax (gluten-free), and Super-Duper Brownie Mix with flax and teff (gluten-free). The family range includes Playful Pizza Dough with chia and flax, Ginger Giggles Biscuit Mix with barley, rye and flax, Chocolate Giggles Biscuit Mix with raw cacao, barley and flax, and Scrumptious Carrot Cake Mix with oats and flaxseed. We received a pack from each range. The attractive packaging with its muted colours makes the packs stand out from the run-of-the-mill brightly coloured packaging - in a really good way which reflects the wholesome ingredients. The Super Oat Flapjack Mix just needed the addition of butter and honey (or other substitutes). The instructions are straightforward and the end result was delicious - the sultanas added a welcome extra burst of flavour and moisture. We also enjoyed the Super-Duper Brownie Mix which was really chocolaty; it includes dates which are a healthy ingredient and which add moisture and richness. You add your own sweetener of choice, so that makes it great for health-conscious families or those with food allergies. In both our boxes, butter can be replaced with coconut oil for those on a dairy-free diet. Buy online from the Sweetpea pantry website, or from your local farm shop, health food store or retailers including Sainsbury's and M&S Simply Food. These are great tasting mixes, really easy to use with children and full of healthy ingredients - a super range. It's no surprise to learn they have won lots of awards! Parents in Touch recently received a great box of snacks from Snact; they aim to help combat food waste by using fruit that was due to be thrown away and using it to make delicious snack bars and fruit jerky. I was looking forward to trying these out as I think the idea behind them is brilliant. I hate food waste and it is shocking how much 'good food' is simply thrown out each day that is still perfectly edible. Snact have been making deliciously sustainable snacks to tackle food waste since 2013. Every day in the UK we throw out tonnes of perfectly good fruit. Snact saves surplus fruit and turns it in to tasty snacks. All snacks are packaged in fully home compostable wrappers to ensure that their packaging matched their ethos of creating less waste. Apple & Cinnamon Kick Banana Bar - You can taste each of the flavours in this bar, I love the combination of cinnamon and apple and the banana flavour is very subtle.You can see from the ingredients just what you are eating: Dried banana, gluten free wholegrain oat flakes, pumpkin seeds, dried apple powder, pecan nuts, apple fibre and ground cinnamon. Beetroot & Cacao Blast Banana Bar - This was my favourite of the 3 bars we tried, it had a great flavour and the texture was soft and a little nutty. Carrot & Spice Boost Banana Bar - Another very tasty bar, a few more spices going on here including nutmeg and ginger, along with some coconut. Apple & Raspberry Fruit Jerky - These are a great snack and each pack saves an apple! They are made from 80% whole apples and 20% raspberry puree. Snact says that each bar saves a banana from going to waste, they are vegan, gluten free, part of your 5 a day, they have no added sugar, no additives or preservatives and they have compostable packaging. We througly enjoyed trying these bars out, it is good to know that what you are eating is helping to tackle a food waste problem and the fact that the packaging is compostable too is a big bonus. Snact bars can be purchased directly from the Snact website. Find out more about them on Twitter and Facebook. "The Natural Family Co (NFco) was developed by the founders of Jack N’ Jill Natural Care, a trusted leader in children’s natural oral care for over 40 years. The new NFco range is designed for use by the whole family. Natural products are driving overall growth in the oral care category as people search for effective products that don’t rely on artificial chemicals, sweeteners and preservatives. NFco toothpaste is a gel formula that delivers cavity protection from Xylitol and a clean feeling mouth from the fresh taste of Australian Native River Mint. Developed for health and specialty retailers, NFco toothpastes are available in four varieties Original, Sensitive, Whitening and Propolis & Myrrh. Made in Australia the NFco toothpastes are free from fluoride, SLS, Parabens and harsh chemicals. All ingredients are naturally sourced and are not tested on animals. The carefully designed packaging is biodegradable, compostable and earth-friendly. The Bio Toothbrush is made from Non GMO Cornstarch and comes in four colour variants, which compliments the toothpaste. With an innovative stand-alone resin base that miraculously balances the brush, these biodegradable toothbrushes make a statement in any bathroom. Now with NFco, people can significantly reduce their carbon footprint and help preserve the planet through the simple, daily ritual of brushing their teeth! "The Natural Family Co range is available online and retails for £7.99 for 110g toothpaste, £7.99 for the bio toothbrush and stand and £7.99 for twinpack toothbrush. Buy from the website. The new Natural Bathtime range encompasses the natural beauty & life of Australia in a bottle of goodness. These products use native extracts and organic oils to beautifully clean and nourish your family. Each of the bathtime products comes in a convenient 300ml pump bottle - these are really easy to use, even with wet soapy hands, as the pump tops are a good size and neatly curved. Many of us are short on space in our bathrooms, so the rectangular shape of the bottles takes up less room. The packs are really attractive though, and will look good in any bathroom. the Bathtime range is free from: Parabens, Sulfates, Palm Oil, Synthetic fragrances & colour. The Sweetness Bubble Bath contains natural extracts and hydrating ingredients to provide an enriching and fun bath time experience. Soaking in a warm bubble bath will leave skin feeling super soft and deeply cleansed and relaxing essential oils such as Ylang Ylang and Palamrosa are perfect for before bed time. The gentle formula is non-irritating and perfect for sensitive skin; the bubbles lasted well through bathtime, so are lots of fun for children. rich, long-lasting bubbles that kids will love. The Sweetness Shampoo and Body Wash is really practical as it replaces two separate products. Natural extracts such as soap bark and orange pearl provide a deep cleansing action without over drying, and quinoa and panthenol support healthy hair growth and enrich the follicle with essential vitamins and amino acids. Glycerin and essential oils deeply hydrates the skin to keep it feeling conditioned, soft and smooth. This gentle sweetness formula is non-irritating and perfect for more sensitive skin and scalps. The Serenity Moisturiser is the last step in a relaxing bath and bedtime routine. Gorgeously scented, children will go off to bed soothed and relaxed by the lovely aroma. I am tempted to keep it for myself! Our Serenity range is a tranquil & soothing unique aromatherapy blend by Jack N’ Jill, with native Australian White Cyprus extract, Australian Lavender oil, Clary Sage oil and Chamomile oil. It contains natural extracts and hydrating ingredients to create an enriching and hydrating formula. This light Moisturiser is formulated especially for children’s sensitive skin with mild and non-irritating ingredients. Rich ingredients such as allantoin, glycerin and panthenol work together to leave skin super soft and deeply hydrated. Ingredients, with Jack 'n' Jill's description, include: Native Orange Pearl - a species of vine with extracts from this plant containing powerful anti-oxidants. It protects the skin from breaking down and has proven anti-inflammatory properties to soothe skin and help fight bacteria and other harmful toxins. Organic Coconut Oil - loaded with good fats, Coconut Oil retains the moisture content of the skin, as the fats eliminate moisture loss. It stimulates hair growth getting deep into its follicles, promoting scalp health as well as adding shine and softness to the hair. Coconut Oil can also prevent hair breakage and split ends. Each 300ml pack costs £9.99. Buy all the bathtime products here. Scooters are an increasingly popular means of transport and many children use them to travel to school. The long dark winter evenings can be a concern - but not if you have Scooti Lights. Shaped like ladybugs and extremely easy to fit Scooti Lights are a fun, simple way to make scooters safe in the dark. Available in 4 bright fun colours (blue, green, pink and red), Scooti Lights can be seen from 500 meters away – a safety essential when crossing the street after dusk. In each box there is a white LED forward facing light. And with a stretchy loop which fits any sized bar it’ll only take a few seconds to make sure your child’s scooter is safe and seen whenever you go out. See the whole range and buy yours from Buggi Lights. A super practical safety idea and so attractive too - I love the look of them. Cocobubble are all about making bathtime fun, with organic ingredients that are safe for even the youngest children. The box was such a treat to receive - as soon as I opened it, a lovely delicate perfume wafted out; a great start! What sets Cocobubble aside from other bath products (as opposed to simply bath toys) is their declared aim to make bathtime fun amnd to increase creativity and imagination. We were sent two lovely packages - the first is the Polar Ice Cap Adventure (£14.50). This includes 'snow' soap paint, 3 mini soap penguins, a snowball bath bomb, a really cute little white felt polar bear finger puppet and a real coconut bowl. The penguins can play in the bowl and there are lots of opportunities for imaginative adventures. It all comes prettily packed and be-ribboned. The second pack is the Magical Wood Bath Bundle (£12). The key element of this is the Magical Wood Bathtime Adventure waterproof book; join Coco and Bubble in their adventure and act it out using the soap toadstools (3, in pretty pastel colours), 3 fizzy bath bombs and strawberry stream soap paint. It's lovely for children to read a book in the bath, and it dried out well after I love the soap paint - such a good way to encourage children to wash themselves (after painting themselves and the side of the bath, and the tiles...) and such fun. The scents of all the products are natural - strawberry in this set - and there's just the right intensity. Our final treat was a Snowman Colour Change bath bomb (£3.50) - like all the bath bombs, this fizzed beautifully - exciting for children (although I confess this was my treat!) - and left the water feeling soft, with a delicate scent wafting around. But what sets these apart is the fact they all have a special surprise - as the strawberry scented ball fizzed, it revealed another colour. The products are vegan, handmade in the UK and - a hot topic - all the packaging is recyclable. In the interests of being child skin-friendly, all products are free of parabens, mineral oils, silicones, PEG’s and phthalates – no need for you to check labels, Cocobubble have done it all for you. Rather than using plastic, they use natural products, for example the coconut shell used in the set we received. All Cocobubble's products will make lovely gifts amd the recipients will be thrilled to get something so unusual and such fun. Browse the whole extensive range on the Cocobubble website. Star 51 are a British Children's fashion brand, all of their collection is handmade in London and all of the materials used in their garments are sourced from within the United Kingdom. The brand takes inspiration from the elegant looks of the early to mid twentieth century with their fine details, endearing shapes and regal silhouettes. We were fortunate enough to be asked to review the beautiful Ruby's London Smoke Grey Faux Fur Gilet. The gilet arrived in a premium, glossy, branded box which very much indicates that you have purchased an item of very high quality. This luxurious gilet is incredibly soft to touch and is made from 100% polyester, it has a light grey ribbon around the waist to secure it. The gilet is also available in Strawberry Cream colour, with matching pink ribbon. The gilet is available to buy now and is perfect for the cooler autumn days. It is a very versatile item of clothing and looks fantastic both dressed up, or dressed down. The silky feel to the lining makes it extremely comfortable to wear and it will become a staple part of your little one's wardrobe this season. 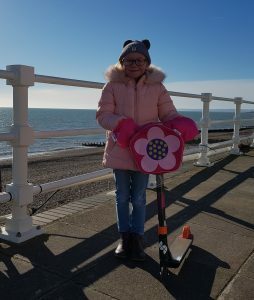 We reviewed the gilet in age 5-6 and our mini reviewer loved it. It was dressed down with skinny jeans, a long sleeve top and boots. It looked very stylish, but also practical as it kept her warm when needed. The Ruby's London Smoke Grey Faux Fur Gilet retails at £90 and can be purchased directly from Star 51 through their website here. The Star 51 clothing collection is also available to buy in House of Fraser. Take a look at the full range of clothing on offer on the Star 51 website. This new Penclic mouse is ideal for both left- and right-handed users. The new symmetrical design brings the Penclic experience to a universal audience and mirrors the functionality and design of its award winning predecessor, the Bluetooth Mouse B2. It's a really attractive piece of kit, comfortable to hold and very stylish - bound to attract comment! This new generation mouse has the scroll wheel located in the middle of the pen's shaft, making it easy to use whichever hand you prefer. The scroll wheel also doubles as the middle click button, which not only eases the transition period when adjusting to this uniquely-designed, laser-focused alternative but also makes the mouse easier to operate for left handers, who will really appreciate this innovative product. The bluetooth means no pesky wires getting in the way, although it does plug in for recharging. What really struck us, when trying it out, is its value for drawing and graphic purposes, giving the traditional feel and control of a pen. It's highly responsive and excellent to work with; perfect for those who spend a lot of time at the computer, helping to avoid problems such as RSI, as it lets you adopt a comfortable working position. Coverage of the whole screen is easy with little movement needed - as with any innovative product, it takes a little getting used to but it's well worth the effort. A great product and the slick packaging makes for a great gift. The Solar Buddies applicators are unique as they have been designed specifically for use by children. I was really looking forward to trying out the Solar Buddies Sunscreen Applicator, I love summer and I always make sure the children are wearing plenty of sunscreen, but I hate applying it! Over the last few years I have tried all sorts of different creams and sprays to try and make the job more bearable, but nothing has worked. When I saw the Solar Buddies applicator I knew I had to give it a go as it has been designed so children can apply it themselves. The orange handle comes off the applicator bottle and is then filled with your chosen sunscreen. Once this is back on, take the blue cap off the bottom and you will see a rollerball, surrounded by a sponge for applying the sunscreen. The big orange handle is chunky and easy to grip for a child. I have a 6 year old and a 4 year old who were keen to try it out. The child simply holds the orange handle and the applicator glides over the skin with the rollerball dispensing the sunscreen as it moves. The sponge surrounding it helps the child rub the sunscreen in. Once the area is covered the child can rub in any excess sunscreen and move on to the next part of the body. You can direct your child where they need to apply the sunscreen so that they can learn where they need to make sure it goes. Our Solar Buddies applicator now lives in my son's bookbag for school. It is so important that sunscreen is worn during the day in summer and knowing that he can now do this easily and thoroughly by himself has really put my mind at ease. He has swimming lessons during school a few times a week and if I had applied sunscreen at home before school this would have washed off, leaving his skin exposed to the sun with no protection. Solar Buddies was invented by mums who found that schools today often have a 'no touch policy', meaning that teachers and other staff were not allowed to apply sunscreen to children. The Solar Buddies applicators have been widely praised as sunscreen can now be applied to children in a safe, convenient and mess-free way. The applicators also have space on the neck of the bottle where you can write your child's name. The re-fillable bottle allows you to choose the sunscreen which is most suited to your child and the clever design of the applicator head means that there is no wastage or mess.The Solar Buddies Sunscreen Applicator has a replaceable head, it is recommended that this is done every 4-6 weeks depending on wear, and these can be purchased directly from the Solar Buddies website for just £3.00. The Solar Buddies Sunscreen Applicator is an absolute essential for us now, and with my daughter starting school in September I will be making sure she has one with her too. Both children were more than happy to apply the sunscreen themselves, it makes them feel more grown up that they can now do a job that they used to reply on me to do. The easy to use applicator makes it enjoyable for them to do, as they used to dread me applying sunscreen to them as much as I did! The Solar Buddies applicator retails at £7.00 for a single one or £13.00 for a double pack and they can be purchased here. Kaya make beautiful children's jewellery to remember special moments in the lives of mothers and children. They create personalised pearl children's and adult jewellery that will be treasured. It's a lovely touch that there are mother and daughter versions. All Kaya jewellery is made of the finest quality pearls, crystals and gemstones; the quality is excellent and the use of pearls is perfect for children. Kaya make and design everything ourselves, so our prices are lower than other jewellery brands and you are guaranteed a unique product. The bracelets we received are Mom & Me bracelets 'Infinity pink' without charms. They came beautifully packaged in two separate pink drawstring pouches which are ideal to keep the jewellery stored safely - especially for little girls. The sizes are adjustable with a clasp and 3cm extension chain for a perfect fit. The bracelets are made with delicate AAA grade ivory pearls, Swarovski crystals and silver rings, threaded onto professional wire with nylon coating, perfect for children's jewellery. So delicate and pretty. Just to give you an idea - on the left I have shown the bracelets with butterflies. There are so many bracelets and embellishments to choose from. "Safety: Children under three years should never wear jewellery unsupervised". To make your bracelets extra personal, you can add a name or text charm to your bracelet at little extra cost. You can see the whole range of Kaya jewellery for mum and child here. Do take time to browse on the website - Kaya Jewellery have many more wonderful pieces of jewellery that will make ideal gifts for all manner of special occasions. A unique and long-lasting gift - and I love the idea of mum and daughter having matching jewellery. Miniscoff make a range of award-winning organic frozen meals for children. They are 100% organic and are carefully hand prepared by their own chefs in Wiltshire. This way we can be sure you are getting the very best. They only use “ingredients that are 100% organic (and local where possible), ensuring the highest standards for taste and nutrition, the animals and the planet. No GM or artificial stuff is tolerated, our meat is from organic, British farms and all our meals have sensible levels of salt, sugar and fat (appropriate for a one year old). By naturally quick-freezing our meals everything is kept as fresh as the day it was made, ready for when you need it.” These are ‘proper’ meals, just like you would cook at home, and they are a real boon for busy parents. There are many times when having a delicious and nutritional meal ready in 10 – 12 minutes (microwave) or 30 to 40 minutes (conventional oven) is just what you need. Miniscoff home-deliver themselves, and you can choose from three meal packs to order direct from Scoff Central, selecting 6, 12 or 30 meal packs with your own choice from across the range. Deliveries can be made Tuesday to Friday between 8am and 12pm. Miniscoff do require that someone is available to sign for the delivery, so they will contact you to arrange a convenient time. The meals are also available through Ocado. The first thing parents will want to know is how well packed the food is, and whether it will really stay frozen. Well, the answer to that is a resounding ‘yes’. Deliveries only take place between 8am and noon, so you know the package hasn’t been languishing around for too long. The food arrived in a sturdy polystyrene box, surrounded by ice packs which were still completely frozen when I opened the box - you can see this in my photos. It’s a sad fact of modern life that security cameras are becoming more and more common. This excellent product from Y-Cam is perfect for domestic use and can be wi-fi or wired. It’s well-priced at £129.99 and the price includes free 7-day cloud storage (you can purchase 30 day storage). I must confess that I didn’t set it up myself but my husband did and he reported that it was quick and easy to do, with sufficient instructions to be clear. Once the camera is installed, simply set up your account and you’re ready to go. It works with Windows, Mac, Android, iOS, Roku and Windows phones – this means it is accessible to almost everyone. You can watch what’s happening, wherever you are, in real time; the wide angle view gives good coverage. No need to worry if the device is stolen either as the cloud storage keeps the film safe. You can set the camera up to send instant notifications to your phone when movement is detected; you don’t need to keep on checking back. This versatile device allows you to set daily schedules and custom recording zones. Image and sound quality are excellent. It copes with low light with its powerful infra-red LEDs; crisp night-time images are produced from 15m away – it really does, as we tried this feature. I was impressed by one reviewer who said that he has one at his business premises and he was able to alert the police to an intruder and they got there in time to catch him red-handed. It’s a neat device that is not intrusive when installed. You can set it to only pick up movement above a certain height, so that you don’t get footage of your cat or dog wandering around! There are many uses beyond burglar protection. We thought it would be excellent in an elderly person’s house, especially if they live alone. Place this to film the bottom of the stairs or the kitchen and you can pick up any mishaps – or lack of expected movement; with their full knowledge and permission, of course. For peace of mind when away from home, I highly recommend this neat and effective HomeMonitor. Purchase from Y-CAM - or from Amazon More information at www.y-cam.com. Buy from Amazon - Y-cam HomeMonitor HD, Motion Activated Cloud Security Camera Solution (No Monthly Fees) Pricing at 01/03/16 - VGA £99.99; HDS: £129.99; HD Pro: £179.99. Excellent value. SnowGo gloves are waterproof gloves in children's sizes - it's such a simple idea that you wonder why nobody has thought of it before! Children love to play in the snow, but woollen gloves inevitably end up soggy and children's hands cold and wet. Here's the answer - wear these over woollen gloves for snow protection. They keep hands warm and dry, allowing children much longer to have fun in the snow. Of course, they can be used on their own for any wet or dirty play and for craft work; or when it's a bit too cold to be outside playing with sand or water with bare hands, use SnowGo gloves. Such a versatile product. They come in three sizes - Small (age up to 3) Medium (age 4-8) and Large (age 9-12), as well as in a range of vibrant colours including red, pink, blue and orange. I wondered how easy they would be to put on, but my nearly 3 year old tester got them on with no trouble; the fingers are generously sized and the cuff length is sufficient to ensure hands keep dry. The gloves are 100% latex and they appear strong and durable. A super product that will be warmly welcomed by parents. You can purchase the gloves from EBay. Find SnowGo on Facebook. ReadyBeds are superb! I am really impressed with the simplicity and ease of use and children love them. They make sleepovers great fun and their portability means they are easy to pack up and put in the car. It has an inflatable mattress (a pump is included) with machine washable bedding and an integral travel bag. The bed inflates easily and quickly and it's equally easy to deflate; the neat packaging holds everything together for storage and travel. My young tester reported that the bed was very comfortable and he's looking forward to using it on his next visit. Excellent value for money too and easily affordable so you can have one at grandparents' homes or to keep one at home for unexpected little guests. Also good to take to hotels and self catering holidays - even if there are beds available, they are often rather high for young ones and they like the security and familiarity of their own special bed. Well made with a fun cover children will love, and looks very durable, too. Buy from Amazon - Worlds Apart ReadyBed Despicable Me Junior Bed . There are lots of other designs available on the Worlds Apart website, so you are bound to find one your child will love. The Junior ReadyBed measures W62, L150, H20cm. ; the maximum user weight is 30kg. A great product which does just what it says on the box. We all want our children to tidy their toys away when they finish playing, and with this gorgeous set of stacking storage boxes, they will be keen to help. The boxes feature cute and cuddly bears - they are even bear-shaped! Just like the three bears there's a small one, a middle-sized one and a big one - but even the big one is easy for children to move and they are just the right height for children, even when two are stacked. The design means it is easy to put toys in so no excuses! Make the most of your space by stacking them two high or side by side; they are attractive enough for a living area as well as being ideal for bedroom or playroom; definitely too nice to hide away! You do need to assemble the boxes but everything is included and the instructions are clear and easy to follow - and I was really impressed with the packaging which ensures the product reaches you in perfect condition. It's all very well made and the brightly-coloured fabric slings complete the effect. Of course, the product is tested to the highest safety standards. I love this - it's a really attractive way to solve a perennial problem and I can see it being a huge hit with children, and with their parents who will appreciate the quality of the design and the manufacture. Buy from Worlds Apart and make sure you look at their other products too. Also available from Amazon - Hello Home Bear Hug Stack Storage, Multi-Colour . These toy boxes are part of the Hello Home Bear Hug toddler furniture family. You can buy other products to complete the look including a toddler bed and desk to make a lovely bedroom for your little one, girl or boy. These all-in-one waterproof suits are perfect for home and school use. Increasingly, children in schools and Early Years settings are spending more tome outdoors - the popularity of Forest Schools and farm-based nurseries bears witness to this. I was sent an All In One Waterproof Suit from Togz, as supplied by Rain-Shine, for review. They are fully waterproof and made in a breath able material which has a pleasingly soft feel, not hard and crinkly as sometimes happens. The elasticated waist and velcro fastenings allow plenty of room for growth and velcro fastenings at wrist and ankle, as well as allowing for easy putting on/taking off, allow the suit to be customised to the child.There's plenty of space to put layers underneath, but the adaptability means the child won't be swamped when waring the suit with less underneath in warmer weather. I was particularly impressed with the zip, which really does do up and undo very easily and seems as though it will be very durable. The suits come with an integral hood which I found stays in position very well. As the suits are bound to be worn in wet and muddy conditions, it's great to know they are machine washable. The fact they come with a lifetime guarantee is testament to the durability - they are certainly very well made and comfortable to wear. I reviewed a suit for a four year old, but the site explains that the suits for toddlers have special features making them easy to use, including a diagonal zip, sewn-in mittens and stirrup straps.Nurseries and schools will be pleased to know discounts are available on the already good value suits - see the website for details. An excellent product which will encourage outdoor play. The dark can be scary for young children and they like the reassurance of having a light on at night - but we don't always want to leave landing lights on all night so this is a friendly and practical alternative that young children will love. By being happy to offer children the comfort a night light offers, we can avoid fears getting out of hand until such a time as children are ready to sleep without extra light. This clever light is both night light and torch - as your child gets older, perhaps at the point she or he needs to go to the toilet in the night, the torch will really come into its own. The rechargeable light comes with a low voltage transformer so it's completely safe and can be left close to the bed at night in safety. The bright picture on the torch is very attractive - there's a Thomas the Tank Engine version too. A practical idea, well carried out and a product which will give children lots of pleasure as well as helping to conquer those night fears with a friendly companion. Find out more on the GoGlow website. Buy from Tesco. Can your child open a seat belt? A child opening the seat belt which secures the car seat is dangerous; When we are driving, we need to have all our attention on the road - we can't afford to be looking around to check that little fingers haven't undone the seatbelt. Beltlock is the answer. I was thrilled by these drinks. Firstly, by the neat green insulated bag in which the arrived which is perfect for a children's lunchbox. And when I opened it - wow! 12 dinky bottles of drink which are so lovely to look at and shaped perfectly for little hands to hold without them slipping. Of course, looks aren't everything and I couldn't wait to try them. First up was the Carrot and Peach which is sweet and refreshing. Next - the Cucumber and Pineapple smoothie which is light and very refreshing. The beet and strawberry has a richer flavour; a good thing about all the flavours is that there is none of that sweet after-taste so often found with fruit juices. My young testers loved them and asked for more. Look at the labelling to find out exactly which fruits are in each bottle - there are more than the name indicates! Packed with goodness, these are 100% fruit and vegetable juice - as such, they have a short shelf life but that's an inevitable part of a truly fresh product with no preservatives. 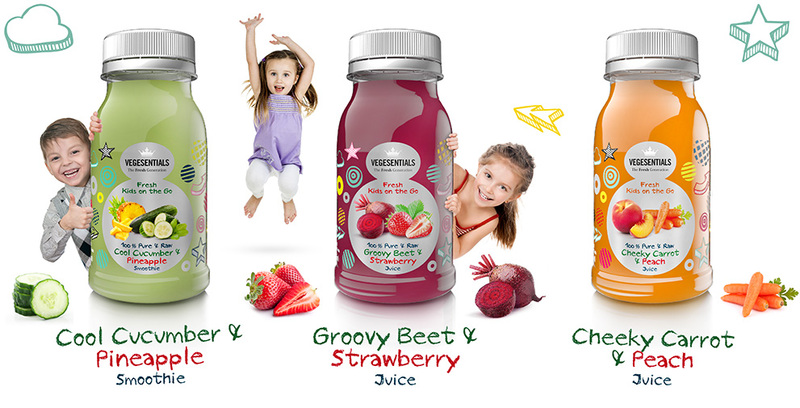 The child-appeal is explained by Vegesentials, who developed the brand in conjunction with their own children - the brand developed from making juices and smoothies for friends' children. We all know how vital it is that our children get their 5 a day and it can be a hard target to achieve. Most children enjoy fruit drinks and smoothies but making them at home is time-consuming and expensive - so here's where these super drinks come into their own. All the goodness of home-made without the hassle. Perfect for lunchboxes and meals on the go. Adults - don't worry, there's an adult range too - and I'm off to search it out! Messy Me sell four different designs of oilcloth which can be cut by them to an exact size to suit your table so no wa ste. The designs are stylish and are an attractive addition to your kitchen table - no need to take them off once the children have finished eating/playing as the subtle designs and colours complement your decor. It's good quality and durable with a wipe-clean surface - I tried it out with paints and they all wiped off really easily. I also used it with play-doh and it makes an excellent surface for this. I haven't tried, but I am sure it will also be excellent as a surface for cooking with children. Of course, it is not suitable for hot dishes. Visit "Messy Me, home of the original oilcloth high chair cover and other beautiful oilcloth products. Designed for busy mums and messy little ones. Messy Me is all about stylish products to help with the mess created by babies and toddlers." See below for more of their practical and attractive products. Little ones spend so much time clambering and sliding around and you don't want them to be wearing shoes all the time - or else you are somewhere, like an indoor activity centre where shoes are not allowed. Snuguns Grippa socks are the answer, with their silicone mesh soles which give great grip (and the area increases as your little one's feet grow). In addition, the clever design features a "Fold-to-Fit" support band which folds down to the ankle bone - providing excellent support and fit.One size fits 6 months to four years and they come in pink or blue. They are ideal for little ones just taking their first steps around the house - especially as so many of us have laminate floors these days. They will also keep your child's feet warm . My young tester has tried them out around the house - he is just learning to walk and they give an excellent grip on our laminate floors. He has also used them in a soft play centre, where again they are a great asset. They have been through a few washes and still look as new, with no colour fading or loss of stretch. It is vital that children's feet are properly looked after so it's good to know Grippa Socks come recommended by The Society of Chiropodists and Podiatrists Buy them from Amazon - SNUGUNS GRIPPA Blue socks See all the Snuguns products here. 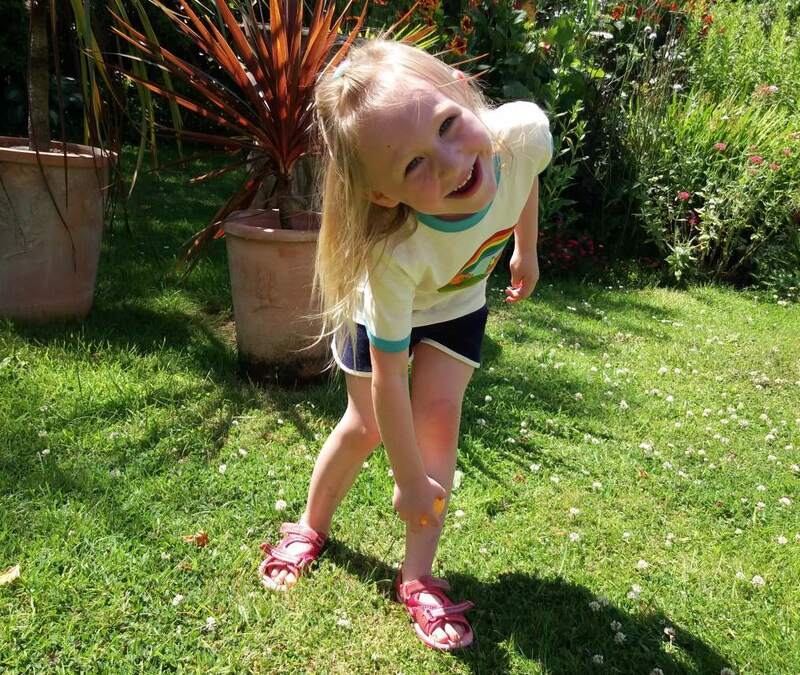 Ever had that heart-stopping moment when your child seems to have disappeared? We live in an increasingly dangerous world, and anything parents can do to keep their children safe must be welcomed. However, whatever devices we use, nothing can replace constant vigilance and training our children to know what do do when lost and to be aware of Stranger Danger. The Child Locator is a fun device, in the shape of a teddy, either pink or brown, which will appeal to young children. It is designed to hook onto shoes or over the child's belt (there's also a mounting strap), while the parent ke eps the key fob. When the button on the fob is pressed, the teddy bear chirps (at 86dB), allowing you to locate your child. Don't forget - what sounds like a loud noise in the quiet of the home, won't sound so loud in a busy shopping centre or sporting venue. The device works within a range of around 50m, but obviously that can vary according to your location. It's very simple to use and attractive to young children. You can buy yours from the Mommy I'm Here website. Also available is an advanced model with an auto-alert, which makes the keyfob beep if your child strays beyond a set distance (shown left). A useful product, but remember to still be vigilant!